What comes to mind when you hear the word, “summer”? Perhaps sun, vacation or heat. What about, “composite”? Maybe decks, patio, material? While it’s true, one of the most common decking materials is “composite”, composite is actually a class of building material and encompasses many different products. While it is associated with decks quite frequently, it’s actually so much more than that. What is a Composite Building Material? Composite – Composite building material examples include concrete, reinforced plastics, cement, steel reinforced concrete and composite wooden beams. These materials are generally durable and strong. Reinforced Plastics – This is a type of plastic that has been reinforced with fibrous material which can include fiberglass, wood and other material. This category can also be broken down into subsets which are categorized by the plastic matrix (what plastic the product is made with). Thermoset – During the curing (heating process that converts the resin into the polymer) process, polymers are cross-linked together which creates an irreversible chemical bond. This means that when heat is applied, it can’t be remelted without losing its chemical properties. This product is highly heat resistant and strong. Examples of thermoset plastics are carbon-fiber car parts, steel braided car tires or hoses, fiberglass boat hulls, fiberglass grating and fiberglass rebar. Organic/Natural Fiber – This material includes wood-plastic composite (WPC) which uses organic reinforcement materials such as wood fiber/flour (including sawdust). While this material is commonly found in home improvement mega stores, it can break down or deteriorate over time due to moisture and UV light. Inorganic – Inorganic thermoplastics are often reinforced with fiberglass or metal. These building materials generally don’t experience the same environmental deterioration that organic fiber reinforced thermoplastic does due to the durability of the reinforced materials. Now that you have a better understanding of composite building materials, let’s dive a bit deeper into the characteristics of different plastic composites and some considerations when choosing the right building material for your specific project. PVC, when used as decking material, is a composite material that has flexible design options. It can be manufactured to have the appearance of real wood and although the natural color is white, it comes in many colors and is most often seen in fencing and decking applications. It is a durable product because it is resistant to insects and rot. It also doesn’t splinter or peel easily. While PVC is a good option for some projects, it isn’t the best fit for all. PVC is naturally white, but in decking projects it is often colored by having a thin wrapping or casing over the composite material, so it has a tendency to fade when in contact with UV light for extended periods of time. Another consideration is that oftentimes the PVC is mixed with other material like wood fibers (sawdust) or fillers, which decreases the structural properties of the plastic. It also is not very environmentally-friendly. When manufacturing and incinerating this product, dioxins are released into the air, which is a very harmful compound to humans, wildlife and the environment. LDPE is a strong material that is in the landscaping and parks and recreation marketplace, but used less often than PVC and HDPE. It is used most often as an alternative to traditional lumber for applications like decking and boardwalks. LDPE contains less mass than other plastic lumber products so it is lighter and is usually mixed with natural fibers like wood to produce a durable building material. This product is durable in the sense that it is resistant to rot and will hold up in extreme weather conditions. While this product is more environmentally-friendly than PVC, due to the low density, LDPE isn’t as strong as other materials. The tensile strength is lower, so it has a better chance of breaking under high amounts of tension. This may limit the applications that this product is best-suited for. HDPE, on the other hand, is very durable and strong. HDPE building materials are engineered out of recycled milk jugs, laundry detergent bottles, and can be mixed with fiberglass strand, or fiberglass reinforced polymer rebar for added strength and structural integrity. Just like PVC, it doesn’t splinter or peel and is resistant to moisture, insects and rot. High Density Polyethylene doesn’t need to be painted, stained or chemically treated, and the color is manufactured throughout the entire product. Its tensile strength is also very high so it is able to withstand heavy loads. Another benefit of using HDPE from Bedford Technology is that our products are environmentally-friendly and are eligible for LEED building points. 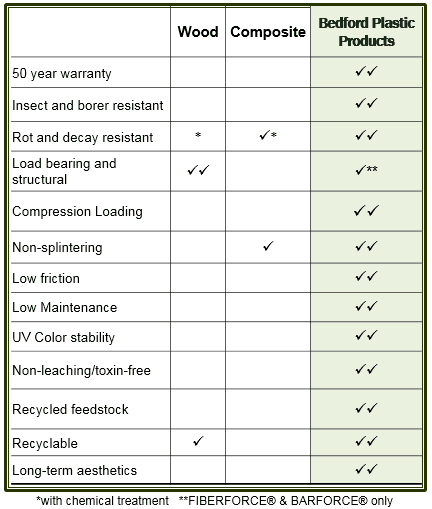 Deciding which HDPE building material is your best solution can be tricky! Below is more information on Bedford Technology product lines to help you find the right product for your specific application.